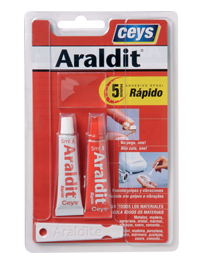 Araldit Rapid is a two component epoxy adhesive, a resin and a hardener, which react when mixed. With a very short hardening, making it ideal for fast connections. Furthermore all cavity filled exist between the two surfaces to be assembled. Une virtually all materials except polyethylene, polypropylene, PTFE and silicone.